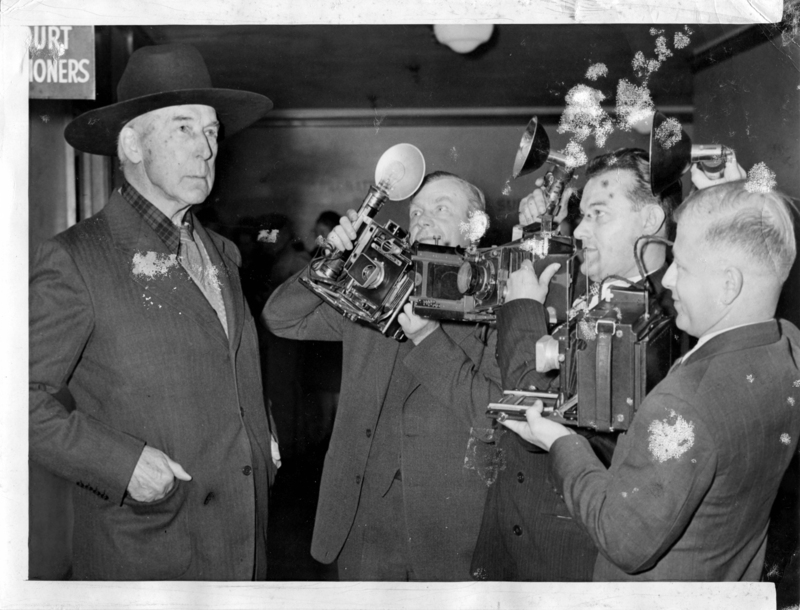 ACME wire photo (6"x8") of William S. Hart at the county courthouse in downtown Los Angeles following a Jan. 14, 1944, probate hearing on the $200,000-plus estate of his sister, Mary Ellen. She had lived at her brother's mansion in Newhall until her death on Oct. 1, 1943. Newspaper archive source unknown; print acquired in 2013 from a Hart collector in Lancashire, England. The print has been damaged, possibly by an acid splash, which appears as white splotches. LOS ANGELES, CALIF.,  William S. Hart, 70-year-old Western hero of silent films, gets another camera session as he appeared in court here to attend a hearing on the will of his late sister, Mary Ellen Hart, who died last Oct. 1, leaving an estate valued at more than $200,000. It should be noted that Hart probably wasn't 70. During his film career, which he started in his late 40s, he said he was born in December 1873 (in which case he would be 70 here). It is believed he was actually born in 1864  but we can't know for sure because the birth records in his home town of Newburgh, N.Y., seem to have been lost to fire in the late 1800s. LW2318a: 9600 dpi jpeg from original print purchased 2013 by Leon Worden.